William Aden, M.D. is a board-certified ophthalmologist by the American Academy of Ophthalmology. Dr. Aden earned his undergraduate degree from the University of Mississippi in 1966. He subsequently received his medical degree from the University of Mississippi in 1970. Dr. Aden then completed an internship at Baptist Hospital in Jackson, Mississippi before training as a resident in Ophthalmology at the Baylor College of Medicine in Houston, Texas. In 1974, he completed a fellowship in Ophthalmic Pathology at the Baylor College of Medicine. Dr. Aden returned to Mississippi in 1974 and has been in continuous private practice in the Jackson metro area since that time. 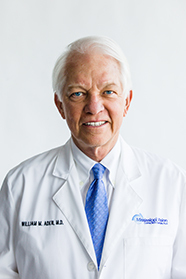 He is a member of the American Academy of Ophthalmology, the Mississippi State Medical Association, Windsor National Associates, and the American Society of Cataract and Refractive Surgeons and is a former president of the Jackson Ophthalmological Society.